This Psalter is named after one of its owners, John Grandisson, who was bishop of Exeter from 1327 until his death in 1369. It was adapted for his use, having originally been made for someone who perhaps lived in the area of Chichester. Between the Calendar and the start of the Psalms is a series of pictures, beginning with this page. 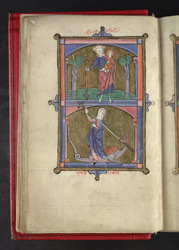 The upper register shows St. Christopher carrying the Christ-Child across the river, and the lower register shows St. Margaret killing the dragon.